help guides us in a more productive direction. It is fascinating to sit and watch a herd of horses. They are perfect partners in experiential learning due to their finely tuned sensitivity: as prey animals, they have been able to survive in the wild based on their ability to be aware of what is going on in their environment, to communicate clearly to their herd and act as a group without hesitation. They can also sense what we are really thinking and feeling when we interact with them. This level of intuition is what allows horses to provide honest feedback to us. Horses care about what we bring to the table in relation to how we treat and interact with them. They don't care about our position at work or what kind of car we drive. Are we honest in our interactions? Are we clear in our communication? Are we consistent with our messages? WHAT IS EXPERIENTIAL LEARNING WITH HORSES? chance for an individual to explore a goal, work on an issue or simply see what evolves. It's a chance to grow, learn and explore in the presence of a horse as your guide. 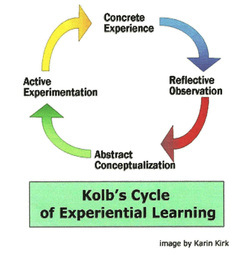 to experiment, explore and learn from the experience. see how they are dealing with and / or being in their personal and professional worlds.